Pressure Compensating: Can be used on slopes and multi-levelled gardens and will water at the same rate at the high and low points. Higher Flow Rate: The 3lph flow rate is the highest allowed under water restrictions which means you can water more of your garden faster. PLUS Anti-Root Intrusion: The diaphragm cover is impregnated with Copper Oxide as part of the mould. This inhibits root growth which would otherwise block water flow over time. The addition of impregnated Copper Oxide, rather than a chemical alternative means it does not deteriorate; giving you peace of mind that your lawn and garden are getting the exact amount of water they need to thrive. 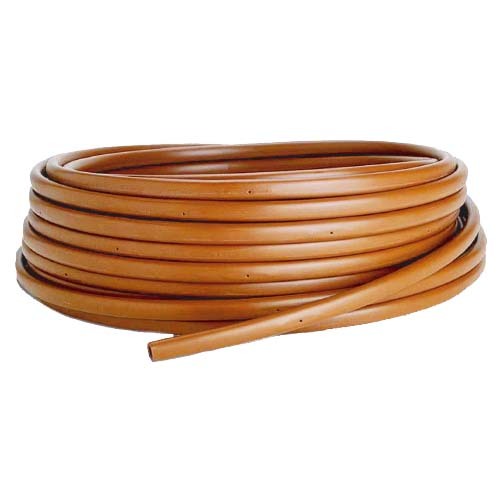 *Ordering multiple rolls of 200m drip tube? Give us a call on 03 8555 1011 to organise the best shipping price! Do I need to bury my drip tube? Unless a drip tube is designed for use under ground, with anti-root intrusion technology, it’s should not be buried under soil. However, performs at its best when installed under mulch where the water is delivered with minimal evaporation.